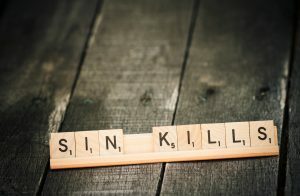 Once conviction sets in, David quickly confesses, “I have sinned against the Lord.” In Psalm 51 David writes, “Against you only have I sinned.” Why not Bathsheba, or Uriah? If we are honest, it bothers us that David fails to mention those who received the brunt of his sin. I’m sure there were moments, not recorded for us, that David expressed the particulars of his guilt, but maybe God has a different agenda in these verses. Maybe God intends for us to know there are a priority of offenses, and the greatest offense when we sin is against the Lord. Perhaps though, God intends to teach us something else too. What if he wants us to connect the dots of our sin, that to sin against the Lord leads to the harm of others? The two great commandments, love God with all of your heart, soul, mind and strength, and love your neighbor as yourself are deeply connected. To fail to love God, and thus not obeying His Word, will always lead to a failure to love your neighbor. I think David knew this all too well; to confess to the one (his sin against the Lord alone), was to confess to the other. Here’s another truth that follows: a failure to love God, will always impact the people around you. What a blessing to read your blog. So true and thought provoking.